It is a common occurrence that traffic accidents happen. Whether it was your mistake or not, if you received a traffic citation, understand that not all is lost. Many people come to us at the Yau Law Firm asking whether they should just pay the ticket–after all, the traffic report says they are at fault. Although it will always be our client’s choice as to how to dispose of the unfortunate situation, we highly advise against paying the ticket or handling the matter without first consulting an attorney. What are accident/crash reports?When 9-1-1 or other law enforcement are called to the scene of a traffic accident, typically, the law enforcement officers will create a “journal” of the events that transpired. 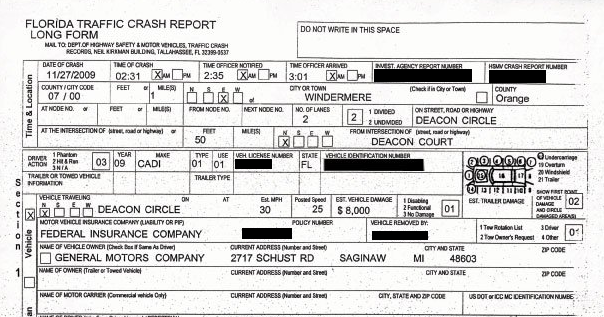 The information contained in the crash reports include the name of the drivers of each vehicle involved, including motor vehicle insurance information; the model and make of each vehicle involved, the time and date of the crash, whether any emergency medical personnel was called to the scene, whether any driver received a traffic citation, and sometimes a determination of fault. Many assume that these crash reports would be referenced during a trial or court hearing to determine fault. In fact, it is not admissible as evidence. Florida Statute 316.066 states that Florida Traffic Crash Reports “may not be used as evidence in any trial,” whether it is a civil trial (such as a trial for a civil traffic infraction, or even a lawsuit for personal injuries) or a criminal trial (such as DUI’s). This law, however, does not prevent an officer from being able to testify in court about statements you made to him or her at the scene of the crash. If you received a traffic citation, or you would like more information about traffic crash reports and personal injury claims, give us a call today. Attorney’s fees for traffic citations start at $69 flat rate, exclusive of costs (if there are any). Our consultations for personal injury claims are always free and complimentary.